Here is the transcript of it. Handsome Narrator: What will happen next? 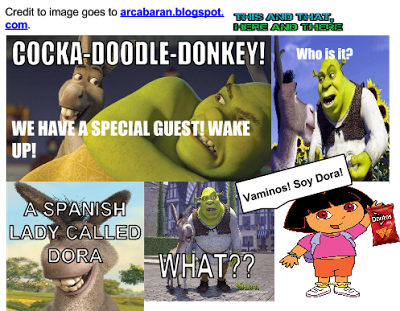 Will Donkey chew on Dora's hair? Will Shrek get annoyed? Will Dora finish the whole bag of Doritos without sharing it with anyone? Why are you asking me, clueless? Find out in the next episode of Shrek Tales!